Denny Jump (Bellevue, WA, United States) on 14 October 2012 in Landscape & Rural. This is the view from a cornfiled near Amy's house. Cornfield in Vermont, why does it seem so inviting. . . .gorgeous! unbridled autumnal joy in these colours ... amy and her family must enjoy this view very much, at any time during the year !! I love the harmony between the forest colours and the the one of the cornfield. 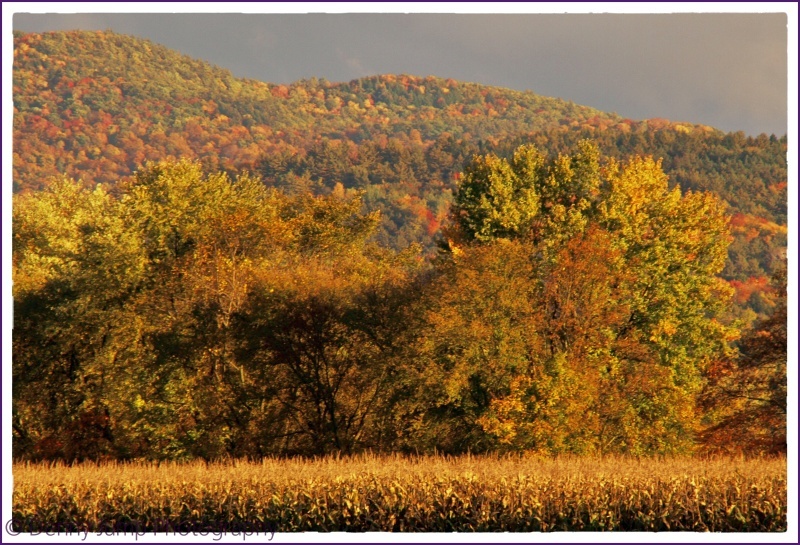 Glorious late day colors, and the golden cornfield as a base ... how beautiful this is, Denny. Wooo Hooo!!!! Those colors are spectacular! I love the golden light, too! Absolutely beautiful! Very well done, Denny! I like the foreground of this cornfield which frame well the gorgeous colors of the forest. Now we're talkin' ! That is beautiful. Wow! What a view. The colors are amazing! Every seasonal color is represented in this . . what a glorious moment. beautiful fall in all it's brilliance, captured in one photo - great job! Very beautiful view of all the autumn colors making there appearance; lovely warm golden tone too! I've been very busy with work too; I'm trying to squeeze as much time as I can; it's been busy though :) Have a great evening! Wow, that's so gorgeous! Now that's what I miss over here! It may be sunny, but those fall colors are stunning. Fantastic shot, Denny! I love that golden field and golden hill. Wow, those autumn colors are beautiful, Denny! The spots of red and yellow mixed throughout the hillside makes for a gorgeous image. I'm afraid we won't see anything like that around here this year. A lot of our trees went brown and dropped their leaves during the drought. Awwww, delight of the delights !